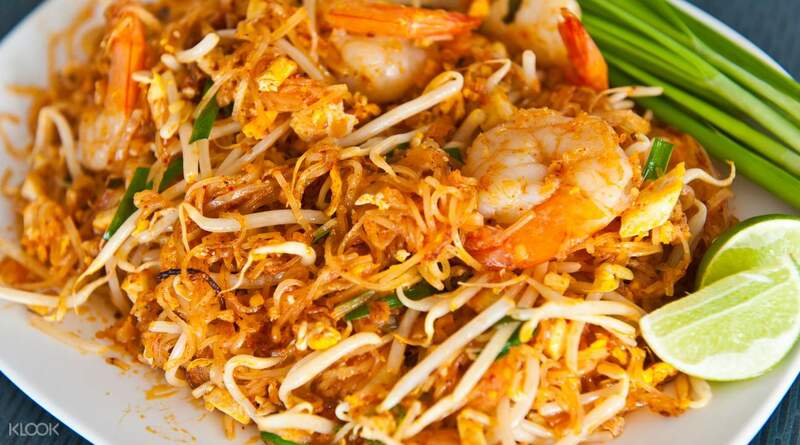 Choose your favorite Thai dishes and learn to make them! Select 5 items from a large catalog of Thai dishes (see below) and make your own curry paste from scratch! Save time by taking the BTS Skytrain to ON NUT Station, where the staff will pick you up and bring you to the school, only 3 blocks away! Highly recommended. Thoroughly enjoyed the class - both fun & interesting. The instructor is very clear in her instructions & willingly share her knowledge about Thai cuisine. 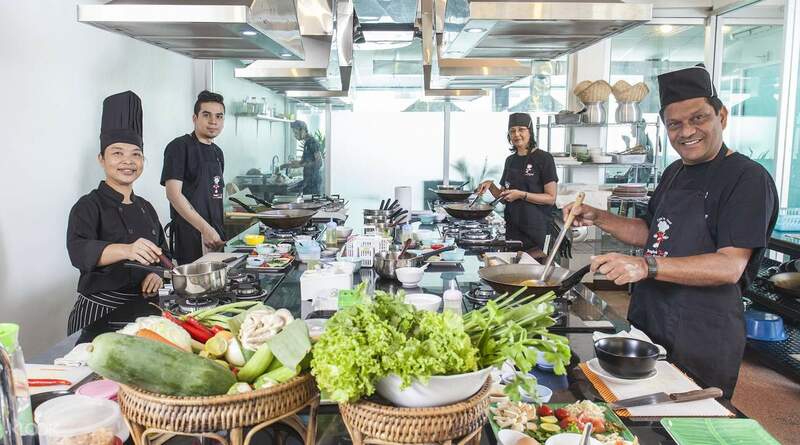 Learn how to cook traditional Thai dishes at a reputable cooking school in Bangkok. Choose from two packages available - the morning or the afternoon class - and learn how to prepare 5 dishes from scratch. Choose any 5 dishes from the catalog of recipes and your professional chef will guide you and teach you how to cook them. Each class starts with a trip to the market, where you'll be given a guided tour and get to select the freshest ingredients for your meal. After the tour of the market, you'll head back to the academy and start cooking! Right after, indulge in the fruits of your labor and get to taste the meals you worked so hard to prepare. This class even comes with an e-certificate and a recipe e-book upon request so you can show off your new skills at home! 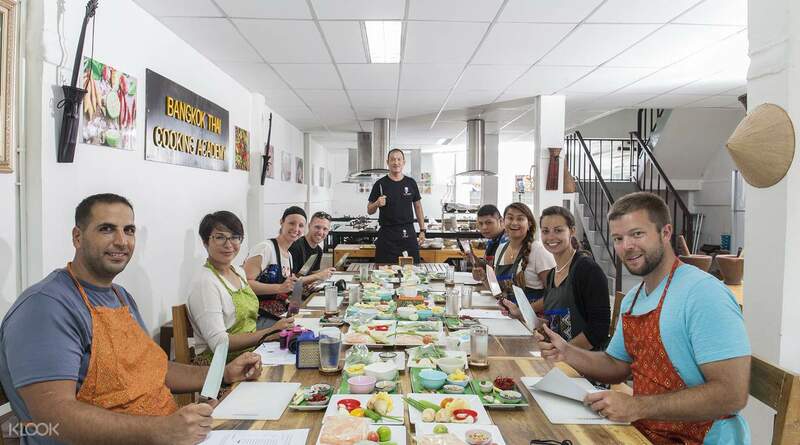 If you're a professional chef looking to expand your skills in Thai cuisine, take the Professional Full Day Class where you'll be training alongside chef-to-be's to create scrumptious traditional dishes at your own dedicated station. 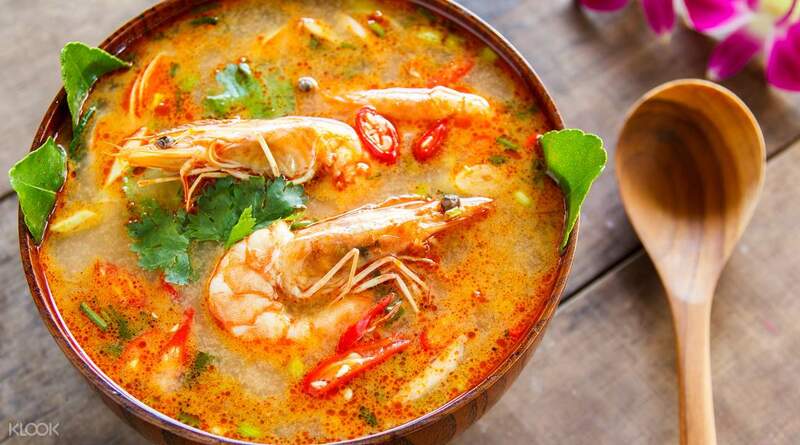 Learn how to prepare Thai favorites like Tom Yum Goong, and more! This cooking class is so well organised and we had a lovely teacher who took us through steps in a easy to follow manner. I loved the fact that we could choose our dishes and we were able to share different dishes so between my friend and I, we had 6 different dishes! More than enough for dinner and they let us pack the left overs which we had as night snack at the hotel!! Loved it and definitely worth the money! This cooking class is so well organised and we had a lovely teacher who took us through steps in a easy to follow manner. I loved the fact that we could choose our dishes and we were able to share different dishes so between my friend and I, we had 6 different dishes! More than enough for dinner and they let us pack the left overs which we had as night snack at the hotel!! Loved it and definitely worth the money! Was one of the best experiences/decisions of the trip so far. The head instructor was knowledgeable, witty and spoke fluent English. She made the entire experience enjoyable and fun. All of the dishes came out amazing and I can’t wait to try them at home. Would recommend highly. Was one of the best experiences/decisions of the trip so far. The head instructor was knowledgeable, witty and spoke fluent English. She made the entire experience enjoyable and fun. All of the dishes came out amazing and I can’t wait to try them at home. Would recommend highly. Wonderful, simply fantastic! This was one of the highlights of my trip to Bangkok and will definitely be coming back to this class with friends and family. After pickup at the BTS station, we get to pick the dishes we want to learn and cook then afterwards we are given a guided tour of the local market and introduced to the local ingredients that are used in Thai food. Once done, we are then on our way to the cooking class where all the fresh ingredients are set waiting for you to prepare according to the dishes you picked from their menu. The hospitality was absolutely brilliant with lovely people joining the class as well. There is much fun to be had at this cooking class as you prepare your dishes by chopping, slicing and cutting your ingredients and then cooking them afterwards. All in all this was simply fantastic and is highly recommended. A big thank you to the staff at the cooking class that made this experience the more memorable. Wonderful, simply fantastic! This was one of the highlights of my trip to Bangkok and will definitely be coming back to this class with friends and family. After pickup at the BTS station, we get to pick the dishes we want to learn and cook then afterwards we are given a guided tour of the local market and introduced to the local ingredients that are used in Thai food. Once done, we are then on our way to the cooking class where all the fresh ingredients are set waiting for you to prepare according to the dishes you picked from their menu. The hospitality was absolutely brilliant with lovely people joining the class as well. There is much fun to be had at this cooking class as you prepare your dishes by chopping, slicing and cutting your ingredients and then cooking them afterwards. All in all this was simply fantastic and is highly recommended. A big thank you to the staff at the cooking class that made this experience the more memorable. Aboslutely amazing experience! We met up at Bang Ha station (there were 13 of us) and proceeded to walk through the local market. This was an educational experience and I learned much about Thai use of spices and vegetables. We then walked back past the BTS station and to the Bangkok Cooking Academy. The ingredients were all setup for us and with the guidance of our fun and entertaining Chef instructor, we started cooking. The experience was amazing, delicious and inspirational. I have a new appreciation for the intricacies that go into making Pad Thai, Green curry, Tom Yum and other dishes. Thank you to KLOOK for making this experience available and thank you to the academy for hosting this experience. Aboslutely amazing experience! We met up at Bang Ha station (there were 13 of us) and proceeded to walk through the local market. This was an educational experience and I learned much about Thai use of spices and vegetables. We then walked back past the BTS station and to the Bangkok Cooking Academy. The ingredients were all setup for us and with the guidance of our fun and entertaining Chef instructor, we started cooking. The experience was amazing, delicious and inspirational. I have a new appreciation for the intricacies that go into making Pad Thai, Green curry, Tom Yum and other dishes. Thank you to KLOOK for making this experience available and thank you to the academy for hosting this experience. We had a great time cooking thai dishes. the instructor is very funny and well versed in her craft. they have a very accommodating crew. the dishes that we've made are delicious! We had a great time cooking thai dishes. the instructor is very funny and well versed in her craft. they have a very accommodating crew. the dishes that we've made are delicious! Definitely BKK worthy experience to learn more about the insights of Thai food.. Guide was very nice and friendly answering all pur questions and helpful in guiding the step by step of Thai Cooking. Plus side is you get to choose different food from the menu ( if you are more than one) and try/ share the food after the cooking session.. Definite must try! Definitely BKK worthy experience to learn more about the insights of Thai food.. Guide was very nice and friendly answering all pur questions and helpful in guiding the step by step of Thai Cooking. Plus side is you get to choose different food from the menu ( if you are more than one) and try/ share the food after the cooking session.. Definite must try! 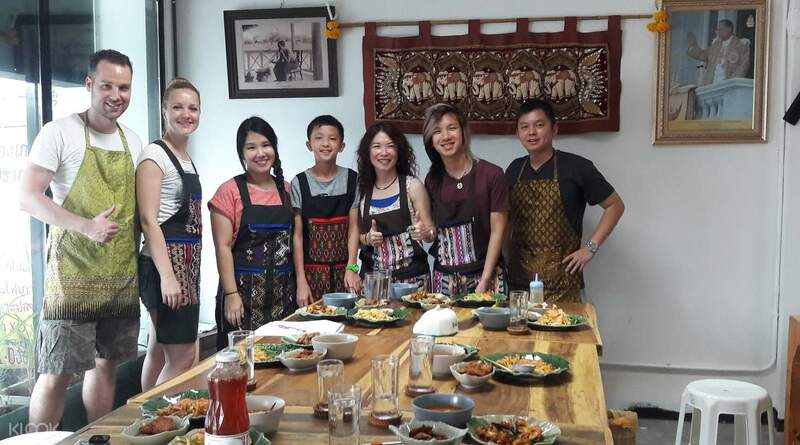 Before even picking up a knife, we are led to a local market, where they can start to connect with the food they’ll be cooking and learn about the key ingredients in Thai cuisine. Once we are in the kitchen, it’s a hands-on experience with each of us having our own cooking station and equipment. The chefs are amiable and patient, so there’s we never any feeling of pressure. The cooking session with lots of fun. All of us really enjoy . Before even picking up a knife, we are led to a local market, where they can start to connect with the food they’ll be cooking and learn about the key ingredients in Thai cuisine. Once we are in the kitchen, it’s a hands-on experience with each of us having our own cooking station and equipment. The chefs are amiable and patient, so there’s we never any feeling of pressure. The cooking session with lots of fun. All of us really enjoy . Love the experience!! The staff are really friendly. it is very easy to learn with clear instructions. I love all the food and I'm so full after having lunch there. Love the experience!! The staff are really friendly. it is very easy to learn with clear instructions. I love all the food and I'm so full after having lunch there.